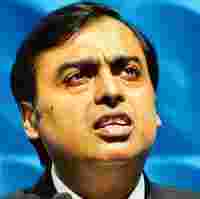 Mumbai: Mukesh Ambani and other promoters of Reliance Industries Ltd (RIL), India’s most valuable company by market capitalization, have infused Rs16,824 crore in the oil refining and petrochemical manufacturer by converting their preferential warrants into shares. Chairman Ambani’s investment in his own company coincides with a global sell-off in the equity market, and its announcement came on Friday, a day when the stock fell to a 52-week low. The RIL stock has lost 38.88% since January. The announcement came couple of days after RIL’s filing to the Bombay Stock Exchange showed that promoter holding in the company had been pruned to 44.8% in the July-September quarter, because of a reclassification of its shareholders. “The amount (for the warrant conversion) has been raised by the promoter by diluting his stake in other privately held companies," said a company spokesperson. Details of these transactions were not immediately available. Eight promoter companies were restructured as subsidiaries of Reliance Industries in the June-September quarter, said the RIL spokesperson. Subsidiary companies cannot have voting rights in the parent company and hence the shareholding had to be reclassified. The shareholding, however, will climb back to 49.01% with the warrant conversions. For the quarter ended 30 June, the promoter group held 51.37%. An RIL posting on the latest shareholding pattern on the Bombay Stock Exchange website referred to the transferred equity as “shares held by ‘Subsidiary Companies’ on which no voting rights are exercisable." “This is mere reclassification of some of the treasury stock that was till now included under promoter holding. That has now been shifted to (the category of) public holding," said Sanjeev Prasad, sector analyst with Mumbai-based brokerage Kotak Securities Ltd. The shares held by eight subsidiary companies, with a total of 94,191,710 shares and 6.48% stake, are no longer shown under promoter’s holding. These are Reliance Chemicals Pvt. Ltd, Reliance Polyolefins Pvt. Ltd, Reliance Petroinvestments, Reliance Universal Enterprises Pvt. Ltd, Reliance Aromatics and Petrochemicals Pvt. Ltd, Reliance Energy and Project Development Pvt. Ltd, Reliance Nutraceuticals Pvt. Ltd and Reliance Pharmaceuticals (India) Pvt. Ltd.
Another sector analyst with a Mumbai-based arm of a global brokerage called it a “mere accounting jugglery" that would “change nothing for practical purposes" but couldn’t think of a rationale behind such a move by RIL. This analyst didn’t wish to be named. On Friday, RIL shares plunged 7.67% to close at Rs1,760.95 each on BSE, recovering from a 52-week low of Rs1,745.10 in intra-day trading. The bellwether index Sensex, in which RIL has 14.52% weight, fell 4.05%. After conversion, the warrants will constitute 7.62% of the company’s equity. And after conversion, RIL’s promoters will exercise voting rights on 51.87% of the total equity, as they still control the treasury stock which is classified under public shareholding. The conversion of the 120 million warrants into equity shares of Rs10 face value was finalised in February 2007 at Rs1,402 per share—at a 12% premium to the then average weekly price of RIL stock. The conversion had an October deadline. At the time of the allotment of preferential warrants, Ambani had paid 10% of the entire amount and had to pay the remaining 90% to convert the warrants into shares. Equity warrants are used by promoters to raise their stake in the company at a future date. A warrant is a security that entitles the holder to buy stock of the company up to a specified time of 18 months at a specified price, which is usually higher than the stock price at the time of issue. Companies issue warrants to enhance the future value of their stock. According to RIL’s shareholding chart, foreign institutional investors reduced their stake in the company to 16.97% in the July-September period from 17.11% in the preceding quarter. Mutual funds slashed their exposure to 2.69% from 2.83% earlier. Insurance companies, on the contrary, increased their holding to 6.26% in the September quarter, up from 5.94% previously.